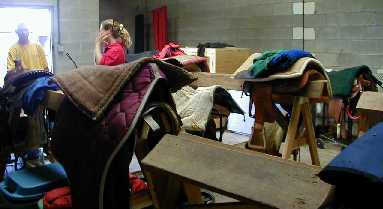 You are now entering a tack room, a place where several students, usually of the same discipline, will leave their riding equipment between classes. We encourage students to bring some sort of storage container so they can keep their equipment all together. There are six tack rooms here on campus, each of which is locked at night. Moving on with the tour we are going to be heading towards Gnu Arena, another one of our indoor arenas.